Notes: Playing in his 38th game since being called up by the Diamondbacks, Goldschmidt tallied his second golden sombrero of the season against the Dodgers on Wednesday night. 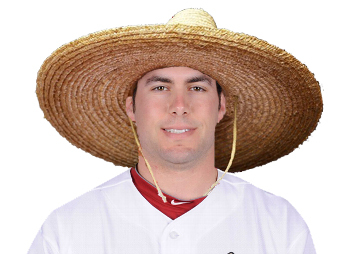 One would have thought that Kershaw’s ejection might have prevented his sombrero, especially considering that Goldschmidt fanned in both of his at-bats against the southpaw. But the big man stayed true to his power-hitting form, fanning in his final two at-bats to finish the job. Be sure to check back for an awesome Paul Goldschmidt-inspired graphic when he makes his inevitable postseason debut in October. That’s the most I can divulge without totally giving it away – Dee and our friend Eat-A-Ton might know where I’m going with this.